Picked by the Big Sky Conference coaches and media to win the league this year, the University of Idaho Vandals can either shrink from the challenge or embrace it. Coming off a 19-14 season, 12-6 in the Big Sky, Idaho has all its key players back, including leading scorer Victor Sanders (20.9 points per game). In addition, stellar point guard Perrion Callandret has recovered from a leg injury that cost him most of last season. He returns as a redshirt senior. Vandals coach Don Verlin believes he has a team that will embrace living up to high expectations. For the Big Sky poll voters, the axiom about past performance predicting future behavior seems to have been persuasive. The Vandals made it to the semifinals of the league tournament last season, narrowly losing to eventual champion North Dakota 69-64. Idaho also played in the CollegeInsider postseason tournament. It defeated Stephen F. Austin State before falling to Texas State in the quarterfinals. The top seven scorers from that Vandals team, representing 85 percent of the scoring and 75 percent of rebounding, are back, older and experienced. Sanders leads them. For the second year, he has been picked to the All-Big Sky preseason first team. Sanders is 11th in career scoring at Idaho with 1,215 points. His 191 3-pointers are the second-most at Idaho, and his quick hands have accounted for 98 steals, tied for sixth all-time at Idaho. Watching him move up the record book will be a pleasant diversion for Vandals fans this year. Verlin, though, says it is secondary to what Sanders is about. Sanders also embodies a valuable quality Verlin sees throughout the Vandals: versatility. Sanders, at 6-foot-5, Jordan Scott, 6-6, and B.J. Blake 6-7, can all play either guard or forward. “One thing I like about this team is the interchangeable parts, not only at guard but at the small and power forward,” says Verlin. Blake was Idaho’s second-leading scorer (10 points per game) and second-leading rebounder (6.1) last year, with season highs of 20 points and 12 rebounds. He is in his second year at Idaho, coming from North Idaho College, and Verlin expects greater consistency from him this season. “B.J.’s physical conditioning is a ton better than a year ago,” he says. “He has shown flashes of being a really good player in this league. The challenge for him is to be consistent. Scott averaged 4.9 points and 4.2 rebounds per game a year ago. Berlin said he could come close to doubling those averages this year. “He is a guy a lot of us don’t talk enough about. I know what kind of effort I am going to get every night from Jordan Scott,” says Verlin. Arkadiy Mkrtychyan, who averaged 8.3 points and 4.3 rebounds a game last year, got the opportunity this past summer to play six games as a member of Team Armenia in the FIBA Basketball World Cup 2019 European prequalifiers. “He got to play against older guys in as highly competitive situation. It definitely helped him,” said Verlin. Junior power forward Nate Sherwood, 6-8, had a knack for producing big performances in key moments last year. He equaled a career-best 11 rebounds in the Big Sky semifinal game against North Dakota, and he scored in double figures in both of Idaho’s postseason wins. The most anticipated returner only played two games for Idaho last year. After Callandret, 6-2, suffered a season-ending injury, Idaho went with Trevon Allen, a 6-2 freshman from Lapwai, at point guard before Sanders moved to the position midway through the year. Callandret also missed a substantial portion of the 2015-16 season with injuries. But when he was healthy he averaged 14 points, four rebounds and two assists per game, with season highs of 26 points, seven rebounds and six assists. 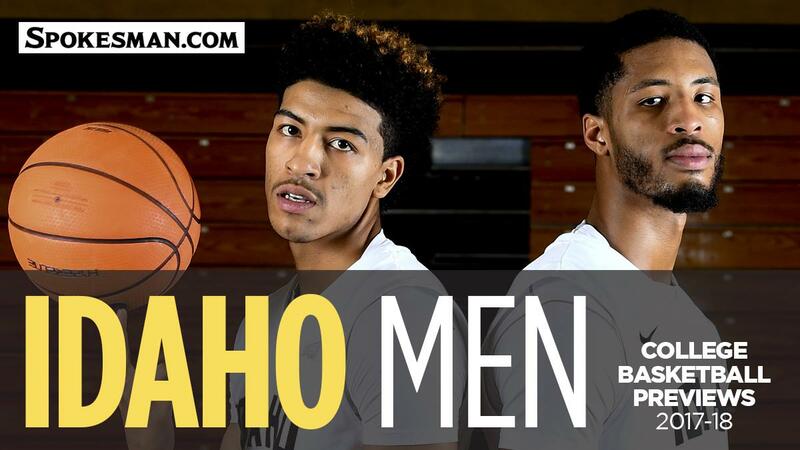 Idaho is bringing on to its team seven freshmen. Losini Kamara, a 6-3 point guard from Brooklyn Park, Minnesota, might be the most heralded. Their role with such an experienced group is “to come in and compete. I have challenged every one to come in and take minutes, and I expect two or three to break through and get substantial playing time,” Verlin says. Idaho under Verlin has primarily played a pack line zone defense. However, with so much valuable returning experience, he predicts “we will be more complex defensively in some of our coverages,” and on offense he is willing to loosen the reins and he expects the Vandals to flow and be creative. For the past two seasons Idaho Vandals fans have wistfully anticipated a dynamic backcourt featuring Victor Sanders and Perrion Callandret for a complete season. However, both missed substantial portions of 2015-16 with injuries. Sanders was out seven games with a broken hand. Callandret lost nine games to a Lisfranc injury in his right foot. Before they were hurt, each was averaging about 15 points a game. While Sanders came back spectacularly in 2016-17, leading Idaho with a 20.9 scoring average, Callandret, a senior, played only two games before a knee injury shut him down again. He obtained a medical redshirt and is back for one last run with the Vandals. Two years ago, Callandret averaged 14 points, four rebounds and two assists per game although his foot never fully healed until after the season. Last year, he was expected to be the Vandals point guard. Without him, that task fell to Sanders for much of the year. Both can handle the responsibility as both point and shooting guard. Idaho coach Don Verlin says the 6-foot-2 Callandret is back to full speed. He is not haunted by his injury history. “I told him that was an event that happened last year,” Verlin says. For Callandret and the Vandals, this year can’t come soon enough. Idaho’s preseason schedule doesn’t feature any marquee names, but it is packed with winners. Add a brutal league roadtrip with a game New Year’s Eve, and by the beginning of January the Vandals might have a good idea how they will fare in the Big Sky Conference. Vandals coach Don Verlin says “we’re usually pretty good on the road.” Good thing. The Vandals open the season Nov. 5 in Reno with defending Mountain West champion Nevada. They are at home Nov. 18 with Sam Houston State, a 21-game winner last year, before heading out to the final edition of the Great Alaska Shootout in Anchorage on Nov. 23. Idaho’s first-round opponent will be Santa Clara, 17-16 last season and 10-8 in the tough West Coast Conference. The Battle of the Palouse is always a highlight. Idaho hosts Washington State in the Cowan Spectrum on Dec. 6. The Vandals go on the road again to take on WAC champion Cal State Bakersfield, 25-10 last year, on Dec. 9 before entertaining Big West champion UC Irvine, 21-15, on Dec. 21. The Vandals close 2017 with the toughest Big Sky Conference road swing, in terms of travel. On Dec. 29 they take on defending champion North Dakota, 22-10, in Grand Forks before heading to Northern Colorado. The Bears were only 11-18 last year, but Verlin picks them to be one of the most improved teams in the league.